I did this project with a class last week to explore las texturas and the Spanish words to describe them. The printable Spanish labels (you can download my pdf below) give examples of things that are smooth, rough, hard, soft, spongy and sticky. 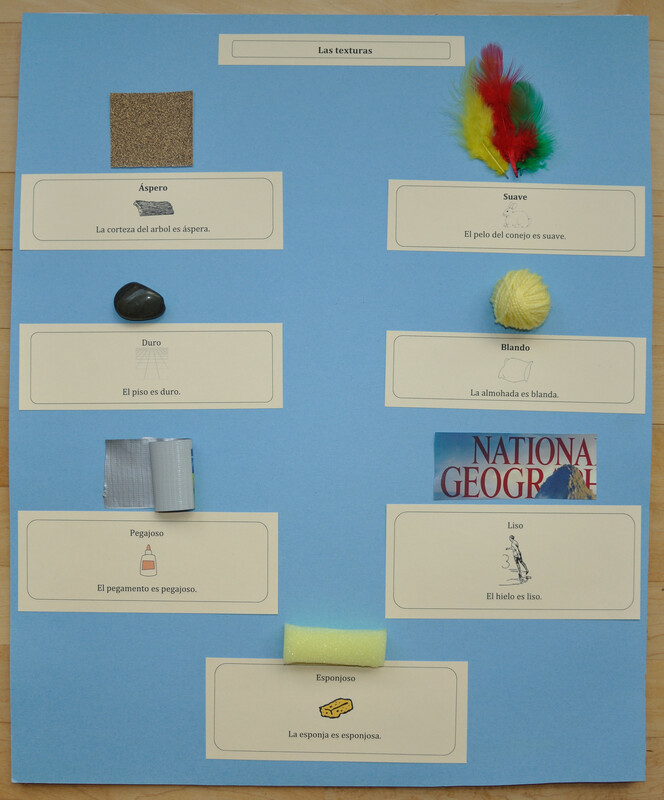 The kids found objects with those textures and attached them to a board with the labels. We talked about other things with the different textures and how objects can often be described by several of the words. As a follow-up activity to encourage students to produce the vocabulary, have students put their hands behind their back and you put things with different textures into their hands. Ask ¿Cómo es? (What is it like?). They identify the textures they feel using the board as a reference and identify the object if they can. You can also put the objects into boxes with holes just big enough for a student’s hand. This is a good lesson for showing how some adjectives are formed from nouns by using the -oso/osa ending. Based on esponjoso, kids can form adjectives for words like chicle, aceite, espuma, arena and miel (chicloso, aceitoso, espumoso, arenoso, meloso). You might want to point out other familiar words like cariñoso, mentiroso, peligroso, engañoso and maravilloso to show that the property the adjective takes from the noun does not have to be physical.